Many steel facrication companies have started to use Lean principles and methodologies as a strategic differentiator in their ability to secure and execute new projects. The ones who have been able to successfully implement the Lean strategies and deploy them throughout the entire business have realized significant results. 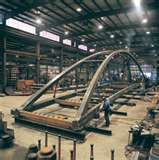 Our professionals have helped clients in the heavy steel industry implement Lean Manufacturing methodologies to reduce the project cost and cycle time, while improving the quality and reliability of their key processes. We have deployed tools such as visual factory (5S), pull systems, andon systems, standard operating procedures (SOP’s), and just-in-time manufacturing to help clients get major projects back on-schedule. Using a hands-on, out on the fabrication floor approach, enables our team to help develop lean leaders from the bottom up, ensuring true culture change. Using Lean Fabrication techniques and assisting the management team in the upfront project planning, collaborating early on with the Project Team to help ensure a successful, cost effective project, ahead of schedule. We will work with you to develop robust plans that embrace change and lead innovation in the fabrication industry.